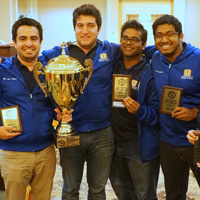 Webster's Team B, which tied for first place with Webster's Team A at the 2016 PanAm InterCollegiate Chess Championship. 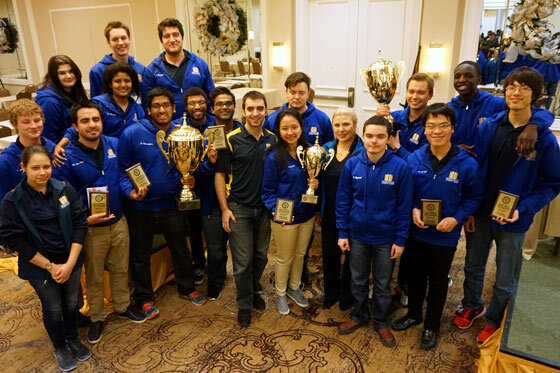 Webster University's four-time defending champion chess team dominated the 2016 PanAm InterCollegiate Chess Championship, becoming the first team in college chess history to have its squads place in the top three of the tournament. Webster's A and B teams tied for first place at the tournament held Dec. 27-30 in New Orleans, while the C team tied for third with Saint Louis University and Texas Tech. The result means Webster qualifies for the President's Cup, known as the "Final Four of Chess," in March, where it will attempt to be the first team to win five consecutive national titles. home with hardware from the PanAm Intercollegiate Chess Championship. Overall, 60 teams from 33 different colleges and universities participated in the tournament, including more than 250 players. With its fifth consecutive PanAm championship, Webster University tied a record held by University of Maryland-Baltimore County (UMBC). If Webster wins a fifth straight final four, it will break the record of four currently shared by Webster and UMBC. News coverage of the win includes this roundup in the St. Louis Post-Dispatch, as well as chess stories on Webster winning again at World Chess.com and at U.S. Chess.org, which describes the multi-round battle between the Webster A and B teams.